Momma Told Me: Make sure you get enough fiber! As silly as it may sound, I am no stranger to fiber. From an early age I developed a curiosity about all that went into Momma's mouth. After all, I spent 70% of my waking time with her during the school year, and sought to emulate her every habit. One such focus for Momma was the constant intake of medication and supplements, intended to help her body navigate post cancer years. Not much older than me, Momma in remission was forced to follow a strict nutrition regimen post-chemo, and faced a big struggle guiding her digestive system back to normal. It didn't take long for smelly, chalky, tubs of powder to don our kitchen counter; fiber supplements for Momma. I recall she had permitted me to try the flavorless variety one time and it certainly hadn't been flavorless, or texture-less. I remember asking what other ways someone might be able to get more fiber in their diet. Primarily Momma rattled off bran muffins, legumes, and various vegetables; all sounded like heaven in comparison. Then one morning I observed my mother eating a bowl of cereal, instead of her ritualistic bagel consumption. On the counter was a light yellow box, rather plain in my child's mind, with boring lettering and rather dull compressed bran pellets on the front. The cereal reminded me of something we'd line the rabbit's cage with at school, but I didn't dare note this to Momma. As it turned out, this box of Original Fiber One Cereal was the perfect solution for Momma, who still had trouble digesting less bland everyday foods. And, with a little bit of cream and sugar, I quite enjoyed a partial bowl myself. Thankfully, the Fiber One range has expanded quite a bit since my childhood. Now there are all sorts of, genuinely flavorful, ways to get some extra fiber and stay full longer between meals. If you've ever had to scarf down a quick breakfast, running late, then you've likely experienced the results a few hours later. Hunger stars to hit once more, even in conjunction with an upset stomach as your body tries to process the offending food and kick start digestion. Studies show 9 out of 10 Americans don't get their daily recommended amount of fiber and as silly as it may sound, we need fiber for digestive comfort and even weight management. You've likely heard before that Fiber helps 'bulk' our digestive intake, which means essential nutrients taken in spend more time being absorbed in the small intestine. Fiber, paired with protein, can really fight of those early afternoon snacking urges and help you feel full and focused through the morning surge of energy. I had a chance to sample two new flavors of Fiber One plus Protein bars, Caramel Nut and Coconut Almond, both equally decadent flavors. I was especially surprised how true the coconut flavor was, paired with crunchy almond, and how easy to eat both varieties were.Not only was the texture soft, but the chocolate dipped coating satisfied my early afternoon sweet tooth. It'll come as no surprise the majority of the Fiber One bar range focuses on a compressed oat base, which reminds me of the granola bars of my childhood. Thankfully flavors such as the real fruit packed Chewy Trail Mix bar, and Oats and Chocolate, offer easy to chew soft bars adults of all ages can enjoy. Sold at fine retailers like Publix, nationwide, the Fiber One range covers dozens of unique flavor combinations and snacks, designed to help make getting the fiber you need a little more palatable. We've been enjoying Fiber One chewy bars in our household for the past few years and I love how they keep me full between meals. The brand even has a line of 100 calorie products designed to fit into diets with low sugar snacking solutions. Be sure to keep an eye out in the cereal and snack bar aisle of your local Publix for these new Fiber One bars! What Daughter Says: Put flavor back in your fiber supplement with delicious Fiber One chewy bars. 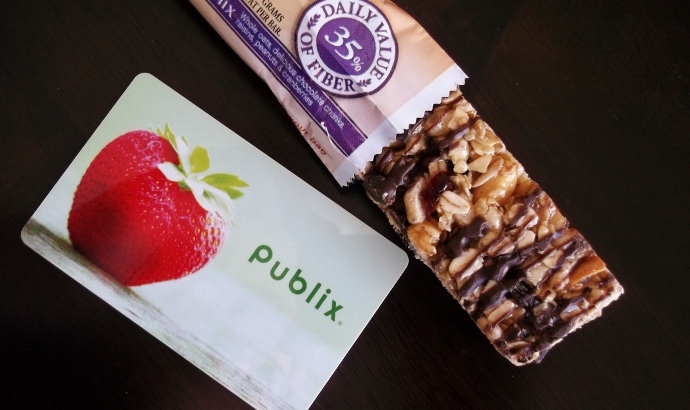 One Momma Told Me reader will win samples of the new Fiber One bars and a $25 Publix gift card! I would like to try the Protein Caramel Nut. Their 100% Whole Wheat english muffins! I'd like to try the 90 calorie peautbutter brownie bars. Strawberry PB&J bars for Kids. I would like to try the 90 calorie peanut butter. 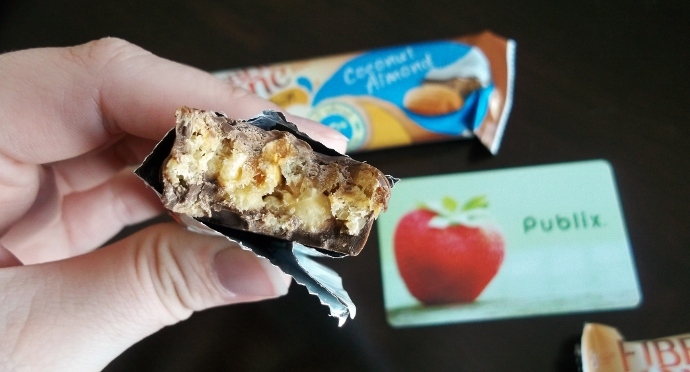 I most want to try the coconut almond protein bar. I want to try the Chewy for Kids. Yummy. I would like to try the Fiber One Chewy Kids for my kids. I'd like to try the 90 Calorie Chocolate Chip Cookie! 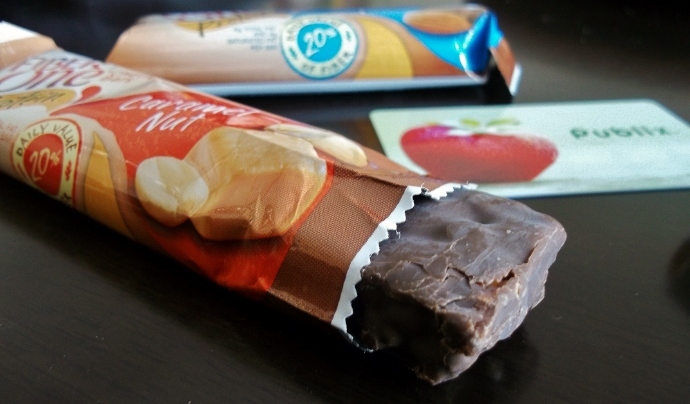 I want to try the Coconut Almond bar the most. I want to try the coconut almond one the most. I'd like to try their new Protein Bars! I want to try all of then Jenna! I'd probably pick the Caramel Nut first. Thanks for all the great giveaways that you host. I would like to try the Chewy Chocolate Bars for kids. I want to try the Chewy Trail Mix Bars! Thanks for the cool giveaway!